Background: This study aims to determine the candidate markers that can be used as DNA barcode in the Lauraceae family. Material and Methods: Polymerase chain reaction amplification, sequencing efficiency, differential intra- and interspecific divergences, DNA barcoding gap, and identification efficiency were used to evaluate the four different DNA sequences of psbA-trnH, matK, rbcL, and ITS2. We tested the discrimination ability of psbA-trnH in 68 plant samples belonging to 42 species from 11 distinct genera and found that the rate of successful identification with the psbA-trnH was 82.4% at the species level. However, the correct identification of matK and rbcL were only 30.9% and 25.0%, respectively, using BLAST1. The PCR amplification efficiency of the ITS2 region was poor; thus, ITS2 was not included in subsequent experiments. 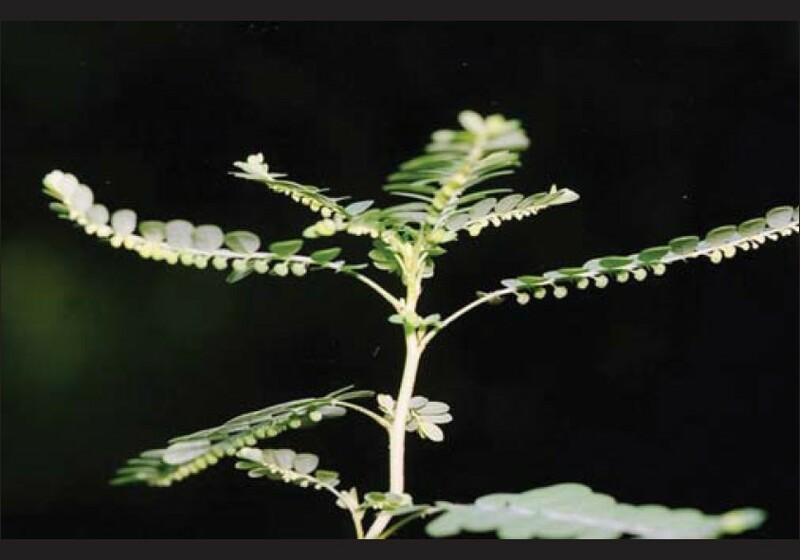 To verify the capacity of the identification of psbA-trnH in more samples, 175 samples belonging to 117 species from the experimental data and from the GenBank database of the Lauraceae family were tested. Results: Using the BLAST1 method, the identification efficiency were 84.0% and 92.3% at the species and genus level, respectively. Conclusion: Therefore, psbA-trnH is confirmed as a useful marker for differentiating closely related species within Lauraceae. Background: Abelmoschus esculentus L. belonging to the family Malvaceae is a kind of one year herbage plant, which is one of the most important vegetables widely grown in Nigeria for its tender fruits and young leaves. It's easy to be cultivated and grows well in both tropical and temperate zones, that is, it is widely planted from Africa to Asia, South European to America. 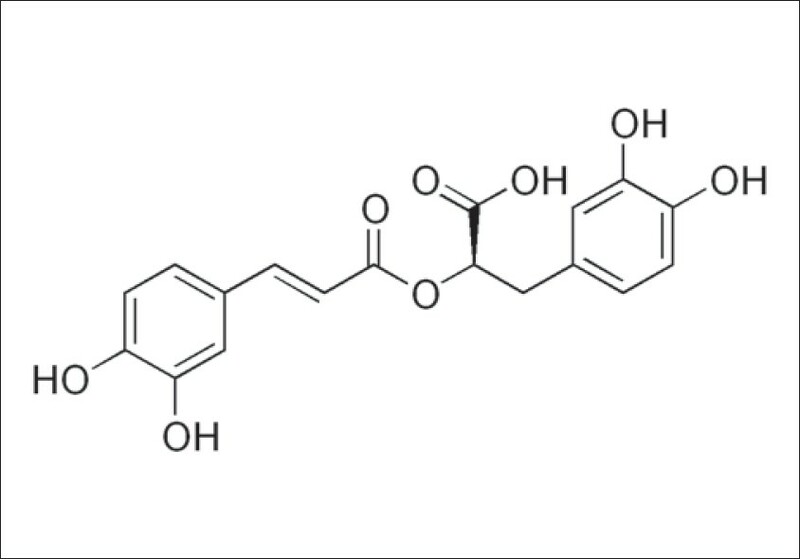 A new flavonol glycoside characterized as 5,7,3′,4′-tetrahydroxy-4′′-O-methyl flavonol -3-O-β-D- glucopyranoside (1) has been isolated from the fruit of A. esculentus together with one known compound 5,7,3′,4′-tetrahydroxy flavonol -3-O-[β-D-glucopyranosyl-(1→6)]-β-D-glucopyranoside (2). 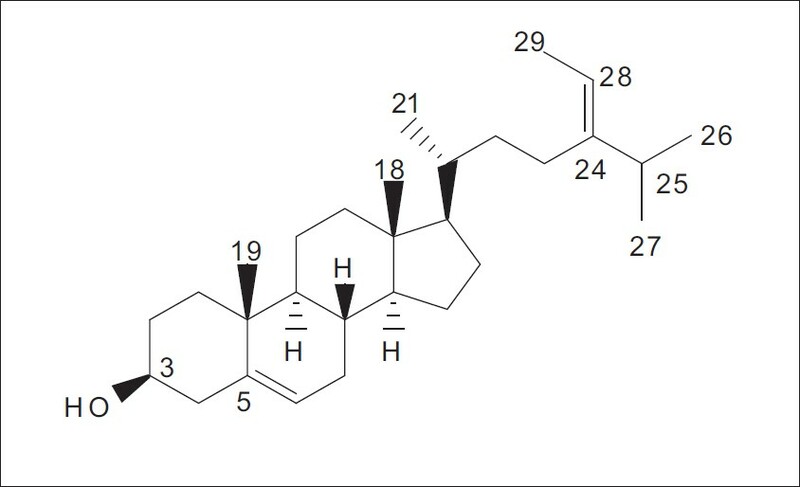 The structure of the new compound was elucidated on the basis of its spectral data, including 2-D NMR and mass (MS) spectra. The antioxidant activities of the isolated compounds 1 and 2 were evaluated by 2 assays, the 1,1-diphenyl-2-picryl-hydrazyl (DPPH) and ferric reducing antioxidant power (FRAP). The present work deals with the isolation, identification and antioxidant activity of the two compounds. Materials and Methods: The compounds were isolated by Diaion HP-20, Sephedex LH-20 column chromatography methods, their structures were identified by physicochemical properties and spectroscopic analysis. The antioxidant activities of the isolated compounds 1 and 2 were evaluated by two assays, e.g., DPPH and FRAP. 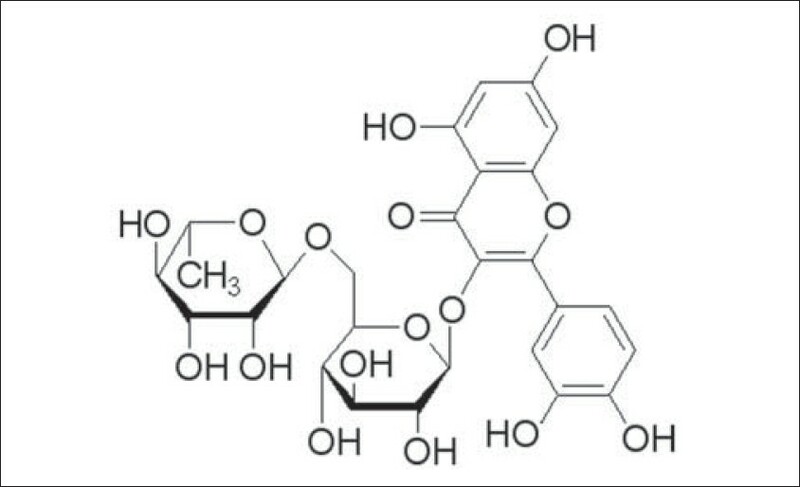 Results: Two flavonol glycosides have been isolated from the fruit of Abelmoschus esculentus L. for the first time, and the compound 1 was a new compound, the compound 2 was isolated from the plant for the first time. Conclusion: The results show that the two flavonol glycosides have strong ability for scavenging DPPH and FRAP free radical by the experiment of antioxidant activities, so A. esculentus may be a natural antioxidants resource. Background: We evaluated the total phenolic content, antioxidant capacity as well as antioxidant activity of five Crataegus species (A1, A2, Y1, Y2, Y4 accessions of Crataegus aronia var. aronia; B2, B3, B5, B6, B7, B9, Y5 accessions of C. aronia var. dentata; B10 accession of C. aronia var. minuta; Y3 accession of Crataegus orientalis var. orientalis and A3 accession of Crataegus monogyna subsp. azarella). Materials and Methods: Antioxidant activity and total phenolic content of fruits were determined by β-carotene bleaching and Folin-Ciocalteu assays. Antioxidant capacity was determined by using 2,2-diphenyl-1-picrylhydrazyl (DPPH) assay. Results: C. monogyna subsp. azarella had the highest total phenol, antioxidant activity and antioxidant capacity of 55.2 mg gallic acid equivalents (GAE)/g dry weight (DW), 81.9% and 31.2%, respectively. C. aronia var. aronia was found to have the lowest total phenolic content (35.7 mg GAE/g DW). 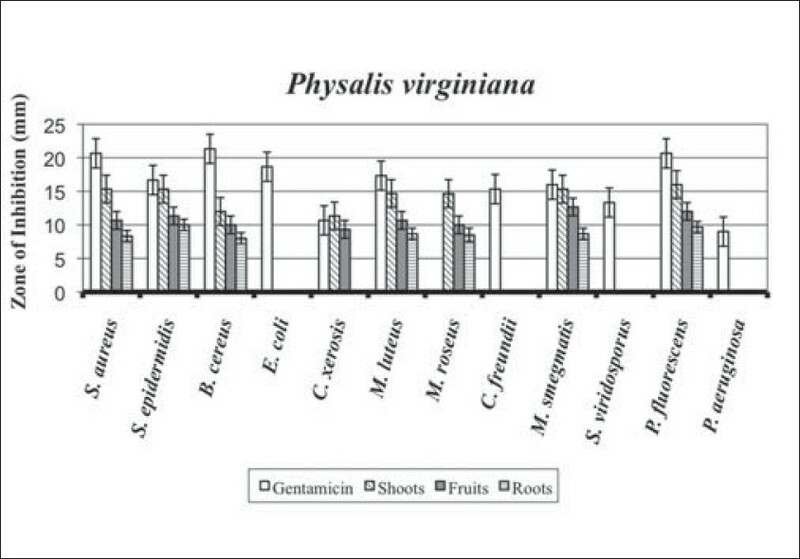 The antioxidant activities of fruit extracts increased in the order of C. orientalis var. orientalis < C. aronia var. minuta < C. aronia var. dentata < C. aronia var. aronia < C. monogyna subsp. azarella according to β-carotene/linoleic acid assay. In recent years, C. aronia var. dentata has gained importance as a commercial species in this region. B3 and B7 accessions had fruit weight more than 14 g, and considerable total phenol content, antioxidant activity and antioxidant capacity. Conclusion: This investigation shows the potential value of hawthorn fruit species as a good source of natural antioxidants and that consumption of hawthorn fruit or its products may contribute substantial amounts of antioxidants to the diet. Background: Physalis virginiana (Virginia Groundcherry) is a member of the family Solenaceae. Several species of the Physalis genus have been used traditionally by American Indians as medicinal treatments. Materials and Methods: This study investigated the antibacterial activity of chemicals extracted from P. virginiana through antibacterial disc and cytotoxicity assays. Isolation and purification of an antimicrobial compound was achieved through flash chromatography and preparative HPLC. Finally, identification of chemical structure was determined from 1 H and 13 C NMR and MS. 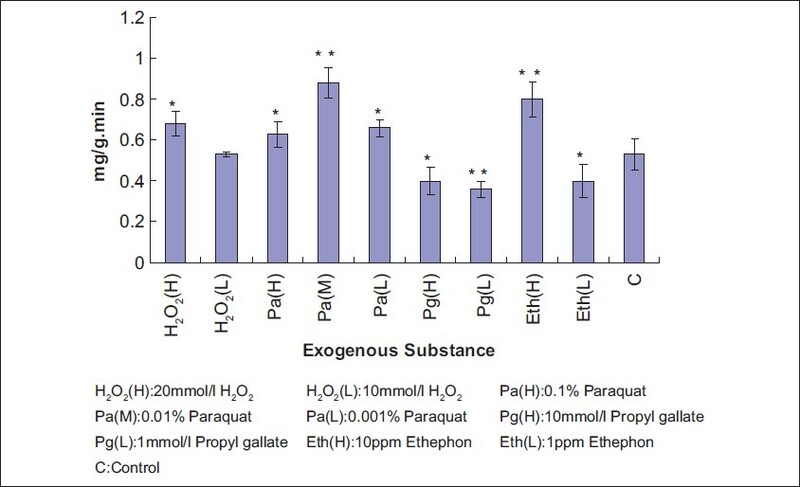 Results: Disc assays showed that crude ethanol extracts were effective antibacterial agents against one gram-negative and seven gram-positive bacterial strains. Cytotoxicity assays indicated that it is less toxic than gentamicin controls. Isolation of the active component showed it to be a relatively polar compound. 1 H and 13 C NMR chemical shifts together with HRMS indicated a similar structure to withanolides previously identified from Physalis angulata. HRMS analysis showed a molecular mass of 472.2857 which corresponds to a molecular formula C 28 H 40 O 6 . Conclusion: An antibacterial withanolide was isolated from P. virginiana using flash chromatography and HPLC separations. The chemical structure was determined by NMR and MS to be the withanolide physagulin V.
Background: Rhododendron is a group of famous landscape plants with high medicinal value. However, there is no simple or universal manner to discriminate the various species of this group. Deoxyribonucleic acid (DNA) barcoding technique is a new biological tool that can accurately and objectively identify species by using short and standard DNA regions. Objective: To choose a suitable DNA marker to authenticate the Rhododendron species. 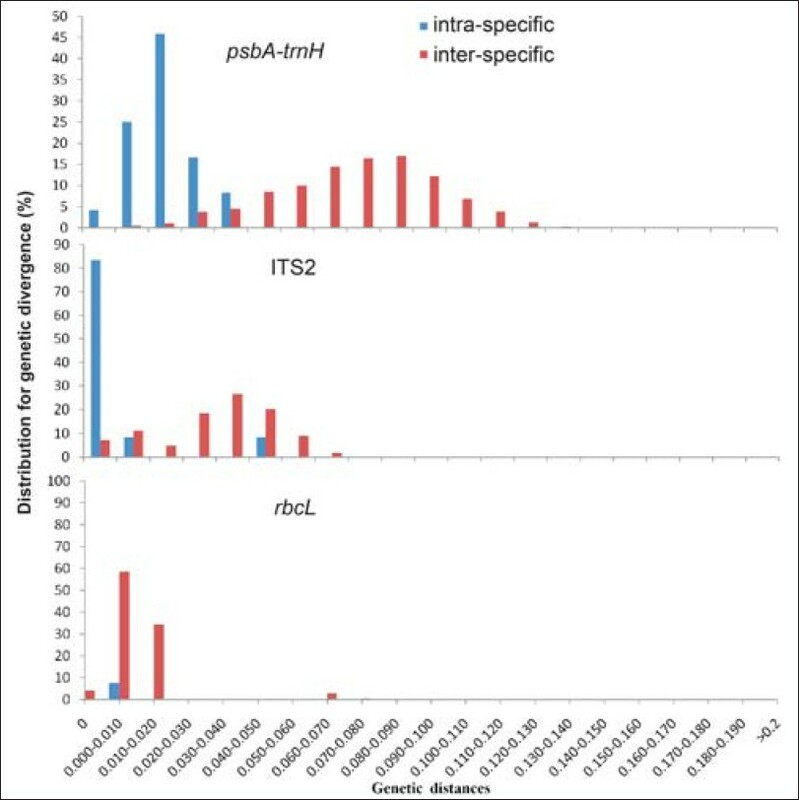 Materials and Methods: Four candidate DNA barcodes (rbcL, matK, psbAtrnH, and ITS2 intergenic spacer) were tested on 68 samples of 38 species. Results: The psbAtrnH candidate barcode yielded 86.8% sequencing efficiency. The highest interspecific divergence was provided by the psbA-trnH intergenic spacer, based on six parameters, and the Wilcoxon signed rank tests. Although there was not a clear barcoding gap, the Wilcoxon Two sample tests indicated that the interspecific divergence of the psbA-trnH intergenic spacer was significantly higher than the relevant intraspecific variation. 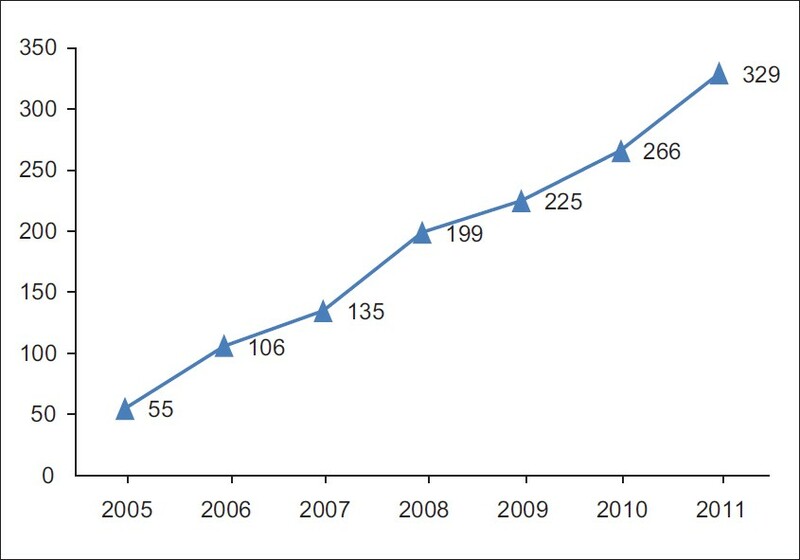 The psbA-trnH DNA barcode possessed the highest species identification efficiency at 100% by the BLAST1 method. The present results showed that the psbA-trnH intergenic spacer was the most promising one of the four markers for barcoding the Rhododendron species. To further evaluate the ability of the psbA-trnH marker, to discriminate the closely related species, the samples were expanded to 94 samples of 53 species in the genus, and the rate of successful identification was 93.6%. The psbA-trnH region would be useful even for unidentified samples, as it could significantly narrow their possible taxa to a small area. Conclusion: The psbA-trnH intergenic region is a valuable DNA marker for identifying the Rhododendron species. Background: A high-performance liquid chromatography fingerprint of different variants of Phyllostachys pubescens was developed for the source discrimination and quality control of Phyllostachys pubescens medicines produced in Zhejiang Province, China. Materials and Methods: Samples of Phyllostachys pubescens collected from nine cultivars in Zhejiang Province were used to establish the fingerprint. Taking the chromatographic peak (isoorientin) as the reference peak, the chromatographic column was Sunfire C 18 ODS (250 mm×4.6 mm, 5 ΅m) at a column temperature of 25°C. The mobile phase was acetonitrile 0.8% acetic acid water solution (in a gradient elution mode) at a flow rate of 1 ml/min. The detection wavelength was 330 nm. Results: 20 common peaks were established in the chromatographic fingerprints of Phyllostachys pubescens. And then by comparing the UV and standard substance with those of the authentic standards and literature, eight main peaks in the fingerprints were identified. 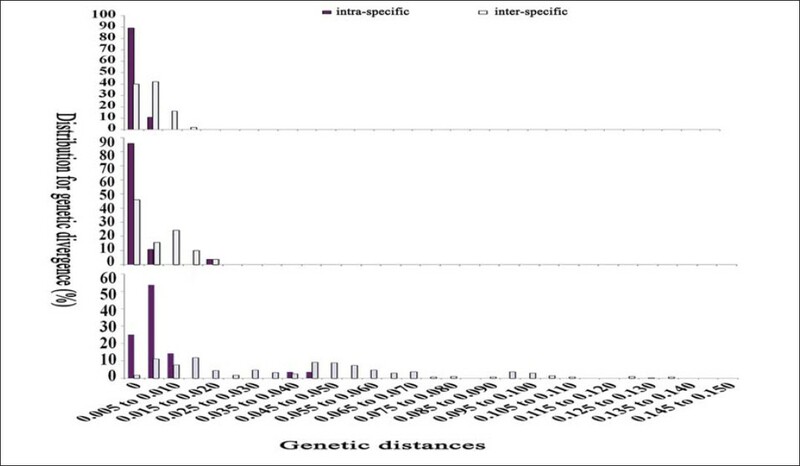 Data of nine cultivars were evaluated statistically using similarity analysis, hierarchical cluster analysis (HCA) in order to establish a similarity standard of fingerprint for quality control of Phyllostachys pubescens, then to classify the samples. The similarity indexes were all above 0.95 between reference chromatogram and each sample's chromatogram. Conclusion: in this study, the methods established are reliable, and could be used to evaluate the quality and to identify the species of Phyllostachys pubescens in the future. Background: Rutin is a bioflavonoid of strong immunostimulating activity from the Toonea Sinensis Folium, which has shown a significant ability to increase the survival rate of white shrimp with bacterial infection. However, no method for the quantitation of this active ingredient in the herb has been reported to date. Materials and Methods: A reversed phase-high performance liquid chromatography-diode array detector (RP-HPLC-DAD) method was developed to quantify Rutin in the Toonea Sinensis Folium, with the HPLC conditions optimized, followed by validation for linearity, accuracy, precision, limit of detection (LOD), repeatability, and stability. Then, the established method was used to determine the content of Rutin in two samples. Results: The separation was performed on a Waters XBridge Shield RP18 column (150 mm Χ 4.6 mm, 5 μm) kept at 25΀C, and acetonitrile and water containing 0.1% acetate acid (18:82, v / v)-composed mobile phase was constantly driven at 1.0 mL / minute during the analysis. Twenty microliters of sample solution or standard solution were injected into the HPLC system and 254 nm was selected to monitor the separation. A strong linear relationship between the peak area and concentration of Rutin was observed within the range of 0.01044 - 0.2610 mg / mL (r2 = 1.0000). The LOD was 0.03915 μg / mL, and recovery of Rutin was from 97.6 to 99.6%. In addition, the method was also validated to be repeatable, stable, precise, and accurate. Conclusions: An efficient and reliable RP-HPLC-DAD method was established, which could be used for routine analysis of Rutin in Toonea Sinensis Folium and to assist in the quality control of this herb. Background: Nowadays, more and more herbal drugs of traditional Chinese medicine (TCM) rely on cultivation rather than natural resources because of overexploitation, and the study on quality of cultivated herbal medicines has become a hotspot in the research field of ecology of TCM resources. 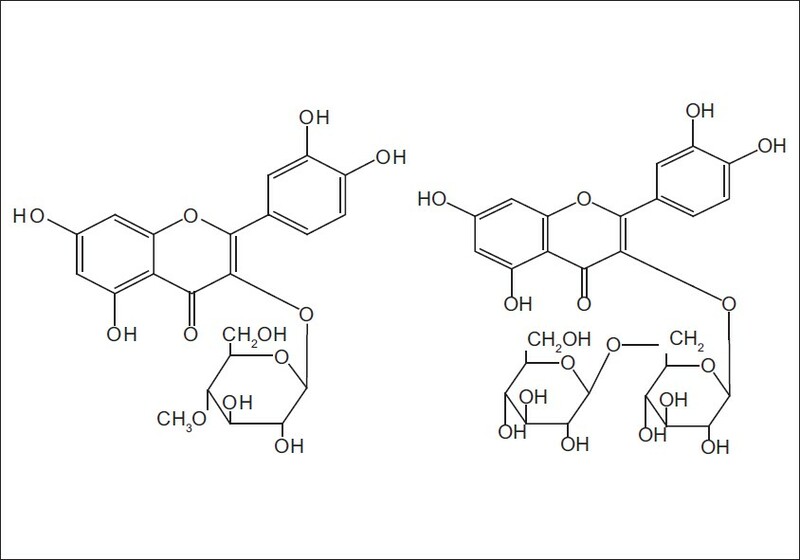 Though some of molecular biology techniques could improve the contents of secondary metabolites, those chemical compositions may differ from what we require from natural products, resulting in different treatment efficacy. Objective: To explore ways and means of improving TCM quality by means of regulating secondary metabolism from the perspective of natural physiological ecology. Materials and Methods: H 2 O 2 and paraquat as carriers of ROS, propyl gallate as a ROS scavenger, and ethephon as a ROS inductive agent were sprayed on Schisandra chinensis (Turcz.) Baill. Results: The hypo-concentration ROS could enhance the activities of POD, PPO, as well as CAT, and propyl gallate acted on the opposite side, but they all failed to break the homeostasis between ROS and oxidase activity and to exert any effect on the contents of the schisandrin, deoxyschizandrin, and schisandrin B. The hypso-concentration ROS could break the homeostasis, reduce the activities of POD, PPO, as well as CAT, and improve the quality of S. chinensis fruit. The ethephon could effectively improve the quality of S. chinensis without the limitation of metabolic regulation. Conclusion: The conclusions accord with the hypothesis that ROS regulates secondary metabolism. Background: Herbal medicine is widely used in the treatment of diseases like diabetes mellitus. We investigated the effects of guar gum in diabetic rats for the reduction of the risk of diabetes and cardiovascular disease. Dietary pattern emphasizing foods high in complex carbohydrates and fiber are associated with low blood glucose and cholesterol levels. Materials and Methods: Diet containing 0%, 5%, 10% and 20% (w/w) guar gum was fed to diabetic rats for 28 days. Blood serum glucose, triglycerides, cholesterol, low-density lipoprotein cholesterol (LDL-C), high-density lipoprotein cholesterol levels, atherogenic index levels, body weights and food intake were monitored at 0, 7.14 and 28 days after induction of diabetes. Results: In spite of the fact that diabetes elevated blood lipids in all rats after 14 days, the guar gum diet significantly decreased the serum concentration of cholesterol, triacylglicerols and LDL-C and atherogenic index. The most significant result in this study was the reduction of blood glucose in diabetic rats treated with the guar gum diet after 28 days versus non- and glibenclamide-treated rats. The gum promoted a general improvement in the condition of the diabetic rats in body weight and food intake in comparison with nontreated rats. Conclusion: The results of this research suggest that guar gum was significantly effective in comparison with glibenclamide in the treatment of hyperlipidemia and hyperglycemia in diabetes rats. Therefore, it may be suggested as a reliable fiber in diabetic regimes in diabetic patients. Context: Hyoscyamus niger L. (Solanaceae) roots are rich of tropane alkaloids, such as hyoscyamine and scopolamine are used as the source of raw material for the pharmaceutical industry. Aims: The aim of the present study was to investigate the effect of calcium, magnesium, and iron ions on the production of tropane alkaloids and excretion of riboflavin in H. niger root cultures. Materials and Methods: The calcium, magnesium, or iron enriched/deprived Murashige and Skoog (MS) growth medium were used for culture of H. niger root tissues. The secondary metabolites were quantified using high performance liquid chromatography with ultraviolet detector (HPLC-UV) and fluorimetry techniques. Results: An increased calcium content in the medium unidirectionally reduced hyoscyamine, while increasing scopolamine production with only a moderate impact on riboflavin excretion. Manipulations with magnesium and iron contents in the medium resulted in divergent changes in hyoscyamine, scopolamine, and riboflavin concentrations. Conclusions: Our results show that increased calcium ion content in the Murashige and Skoog medium may be used for the intensification of the scopolamine production in H. niger root cultures. 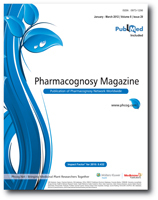 Background: The micropropagation protocol for Phyllanthus amarus, an important medicinal herb used widely for the treatment of hepatitis in ethnomedicinal systems, was standardized with shoot tip and single node explants. Materials and Methods: The micropropagation was carried out for the hyperproducing ecotype (phyllanthin content 463.828 ppm; hypophyllanthin content: 75.469 ppm) collected from Aanaikatti, Coimbatore, and grown in mist chamber, CPMB, TNAU. For micropropagation studies, the leaves were trimmed off and the shoot tips (6 mm long) and nodal segments (single node) were used for initiation. Results: Shoot tips and single node explants gave a maximum of 6.00 and 7.00 multiple shoots per explant with Benzyl Amino Purine (BAP) (1.0mg/L mg/L). 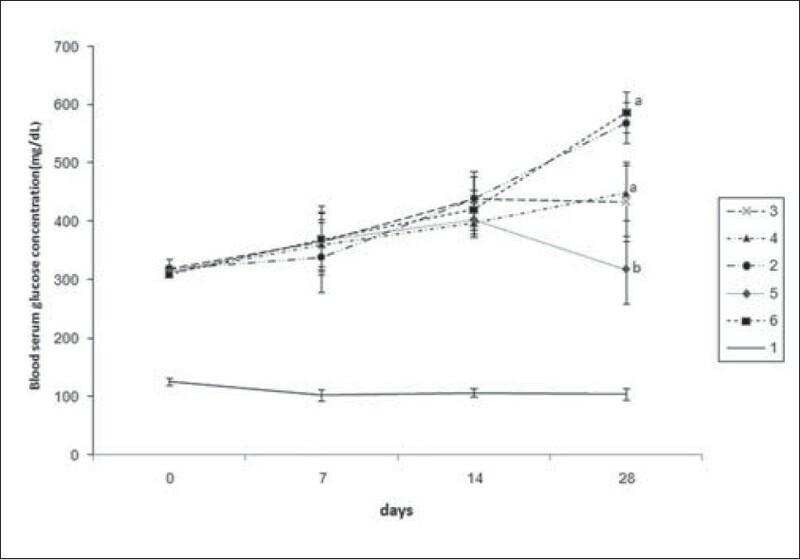 Upon subculturing, a shoot length of around 7 cm with an average of eight internodes per shoot was observed after 20 days in the elongation medium supplemented with BAP (0.2 mg/Lmg/L) and Indole Acetic Acid (IAA) (2.0 mg/L). Seven to ten adventitious roots developed when the elongated microshoots were cultured in half strength MS medium with Indole Butyric Acid (IBA) (2.0 mg/Lmg/L) and NAA (1.0 mg/L mg/L) in 15-20 days after transfer. The rooted shoots acclimatized successfully to field conditions. Conclusion: A method for successful micropropagation of the valuable medicinal plant was established which will provide a better source for continuous supply of plants for manufacturing drugs.